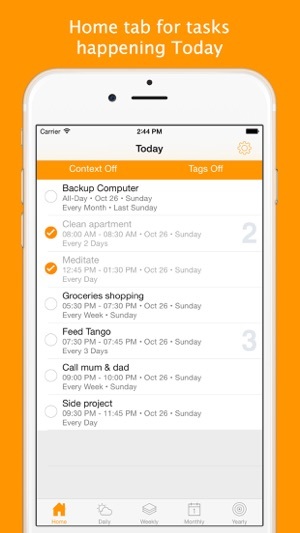 Routines app is checklists for the repeated tasks and chores in your life. Use Routines app to keep recurring tasks from cluttering your calendar, email and other todo lists. With build-in daily, weekly, monthly and yearly checklists, Routines app makes it easy for you to follow your tasks and serves as reminders to the important todos in your life. ■ Overwhelmed by routine houseworks? Use Routines to keep track of the chores and never miss a thing again. ■ Need to cultivate good habits? Use Routines to ensure you are 'doing it' until it becomes a habit. ■ Learning a new skill? Use Routines to setup recurring period for the learning and practice. ■ Always miss your monthly report deadline? Use Routines to remind you of the important tasks at hands. Keep recurring tasks separate from your big todo list and calendar with Routines. Download Routines and find out how this approach has helped many to focus better and improve their productivity. "We use routines at work to standardize the day. This app is exactly what I needed to stick to my routine and remain accountable for my work. Love it." "The perfect app for creating a routine for home, work, anything! Don't waste money on other apps!" - Enter recurring tasks into one of daily, weekly, monthly and yearly checklists. Keep routine tasks separate from your calendar and other todo lists. - Home tab provides a dashboard view of all daily/weekly/monthly/yearly tasks that are happening today. 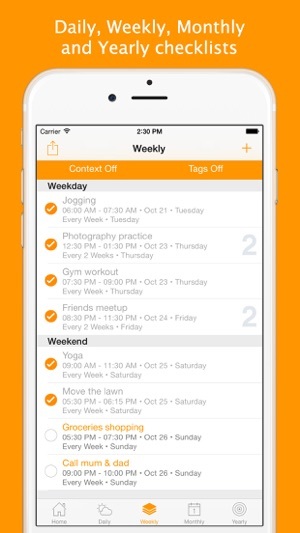 - For each daily/weekly/monthly/yearly list, tap the list title to toggle different views. Views are different grouping and sorting of tasks. - Easily add context to tasks. Define your own context and use it to organize your tasks, for example separating todos for home and for work. Each task can be assigned to one context. - Tags are keywords that help describe the tasks. Assigned one or more tags to each task. 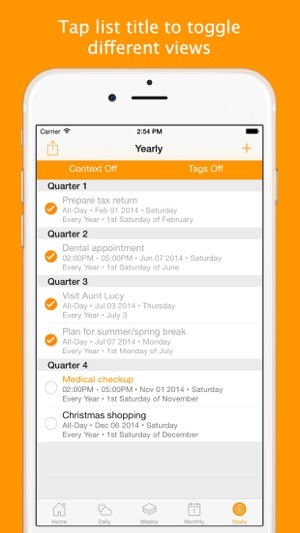 Define as many tags as required to suit how you organize your lists. 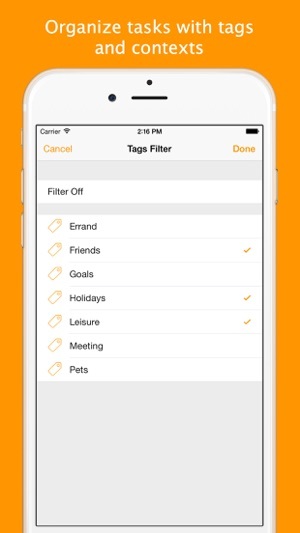 - Tap on the filter bar to filter the list display by context and/or tags. 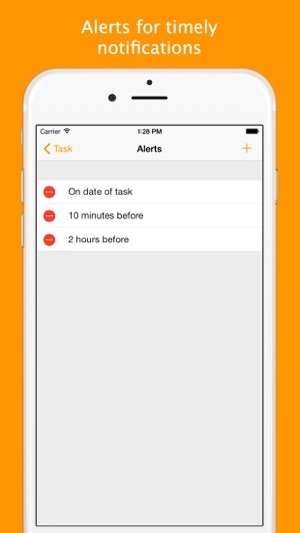 - Create alerts to send notifications before or on the date of the task. Routines uses local notifications to ensure timely reminders even when you are not connected to the Internet. - Turn on Auto-Highlight to color task title in orange for tasks that fall within a range from current period. You specify the range from the app settings. This serves as quick at-a-glance reminders on the tasks due at the moment. - Turn on Auto-Uncheck to automatically uncheck tasks at specified time. For example, setup to auto-uncheck your weekly tasks every Monday morning at 1am to give a clean slate at beginning of each week. Routines is an universal app for iPhone, iPad and iPod touch. Requires minimum iOS 8. Optimized for iOS 9, iPhone 6s and iPhone 6s Plus. Contact support@coopla.com for support and enquiries. We have no way of contacting you if you post an issue as a review. Visit http://www.coopla.com/routines/ for FAQs and detail info. This Routines app update includes improvements and bug fixes. If I had to ask the developers for one thing it would be an Apple Watch supporting app for effortless reminders or just to view the app on the watch face like the "Things" or "todoist" apps allow you to. I'm not buying those apps as Routines is the unique solution I'm after but an watchOS app would be amazing. Overall recommend this app to anyone that does the same stuff every day or week that never wants to miss a thing. Has really helped my productivity and increased my integrity. It does about what you would hope it would do, and no more. It's fairly simple to operate. The key reason I use it is that it allows me to keep the in-built Apple Calendar and Alarm Clock apps clear of regular tasks, and (crucially for me) when the "alarm" comes up for these regular tasks the sound will not override the "Silent" setting of the phone. So I don't constantly have my phone alarm going off at work to tell me to do some arm stretches or get ready to set off for my Pilates class. However there's no decent information on the Context and Tags on the support page - what do these mean, how might you use them, what difference does it make to the display / operation of tasks? Who knows. Also, there's no way to specify that (say) a daily task should occur on only some days of the week. This is a significant oversight - even Apple's own very basic Alarm Clock achieves this. Instead I suppose all you can do is create the task as a weekly task, multiple times over for each day of the week when you want it to apply. I was looking for an app to help me remember day to day things and get a few good habits, and when I saw this I thought, "perfect!" I downloaded it immediately, and started putting things in. I soon found a few areas that could be improved. And quite a few of the functions are hard to use, especially the highlight function, which never seems to work properly, and I'm no technophobe. The interface however, is nice, the lists work, the support team are quick to respond, with simple but informative advice, and it IS free!